Fig. 50 Dynamic analysis. An increase in export demand raises AGGREGATE DEMAND from AD1 to AD2 and results in an increase in the equilibrium level of national income from Y1 to Y2. In moving from Y1 to Y2, a number of steps are involved. The initial increase in exports raises aggregate demand from A to B and produces an increase in real output from B to C. This extra output creates, via the MULTIPLIER EFFECT, additional income and expands aggregate demand further from C to D. The extra spending in turn produces an increase in real output from D to E. These movements continue until a new equilibrium position is reached at point H.
a method of economic analysis that traces out the path of adjustment from one state of EQUILIBRIUM to another. 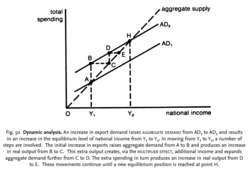 Consider, for example, the effects of a change of the export demand on the EQUILIBRIUM LEVEL OF NATIONAL INCOME. See COMPARATIVE STATIC EQUILIBRIUM ANALYSIS, DISEQUILIBRIUM. Specific to the dynamic analysis on the drive-off of deepwater platform system when DP system is failed, Ambrose et al. Patented binary level dynamic analysis technology underpins the delivery of tools and services offerings. 1) DYNAMIC ANALYSIS SYSTEM PTE LTD Total Price: 31,500. Other key features include dynamic analytics capabilities that allow users to view, edit, create and share dynamic analysis all in one portal, advanced reporting, access to real-time data and receptive discovery analysis. However, a few literatures have been found on the dynamic analysis of FGM plates with various boundary conditions and structural stability analysis under combined compressive, tensile, and shear loads. have teamed together to create the Platform for Architecture-Neutral Dynamic Analysis (PANDA). Li and Wong examine the force analogy method, an algorithm developed in 1999 for solving nonlinear dynamic analysis problems, and its application in earthquake engineering. Dynamic analysis and control system design of automatic transmissions. Parallocity, a key player in the Automated Software Quality (ASQ) industry and provider of the Zeus Virtual Machine[R] (ZVM) Dynamic Analysis Framework for automated defect detection and code analytics, today announced that Akamai Technologies, Inc. The two-volume set will be useful as a reference for professionals involved in earthquake or dynamic analysis or the design of machine foundations in the oil, gas, and energy sector. From that reason it is necessary to perform an elastodynamic analysis of mechanisms operating at high velocities, much more than the dynamic analysis considering the elements as rigid ones. In 2008, Coverity has also introduced a new dynamic analysis product, a new software readiness management product and acquired development tool vendor Codefast to accelerate the expansion of the company's suite of developer oriented products.